Elon Musk is an innovator and the inspiration for the movie version of Iron Man! 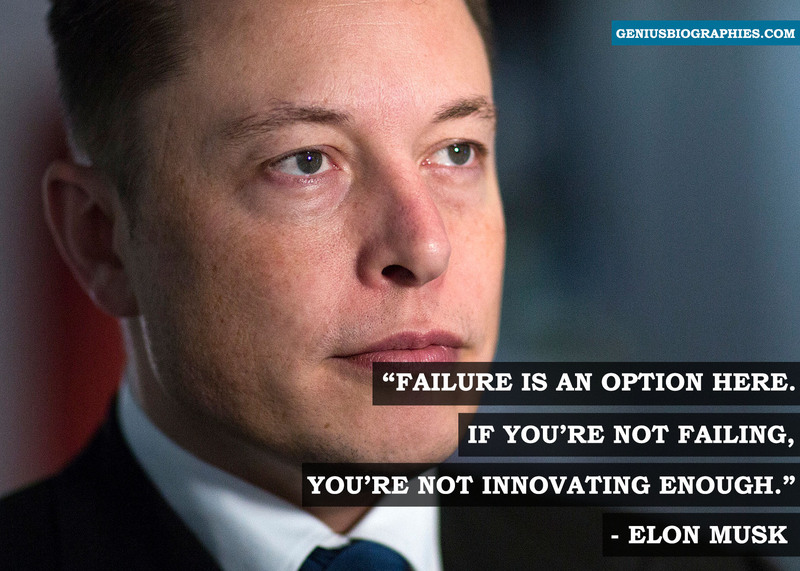 He is most well-known for his dramatic innovation that revolutionized the space technology and electric cars industries. He founded his first start-up, Zip2, after dropping out from Stanford University. An online city guide, Zip2 was soon providing content for the new Web sites of both the New York Times and the Chicago Tribune, and in 1999, a division of Compaq Computer bought Zip2 for $307 million in cash and $34 million in stock options. In 1999, he chaired PayPal, after his company X.com was acquired by it. PayPal was sold for $22 million. In 2002, Musk founded Space Exploration Technologies, popularly known as SpaceX. Musk developed SpaceX with the objective of introducing a private player in the field of space exploration, a Herculean task, to put it mildly. Six years after founding the company, Musk had put in $100 million of his personal investment, en route to making his dream of colonizing Mars come true. This investment was to suffice for 3 attempts at launching the private rockets into space. When at the third try, they failed, every single person in SpaceX was devastated. But Musk took to the stage and reiterated to his employees that they had achieved a major feat that day, they had secured investment for two more tries, and that if they stuck with Musk till the end, they would win. The speech was so inspiring that within seconds the teams got back to work. They identified the cause for the failure in a few hours and a new rocket manufactured in 6 weeks. Tesla Motors was all about sustainable energy consumption. He made a high priced car at low volume, medium priced car at medium volume and then a low priced car at high volume. He was faced with the decision of either pumping his own money from the eBay payout into Tesla or watch his company crumble. Musk put in all of his reserve capital and needed more. To convince Daimler to invest money into Tesla, they had to retrofit a Daimler Smart Car with an electric drivetrain, battery and charger. And they had to do all of this in just 4 weeks! After the economic tsunami of 2008 in which almost all of his companies were in trouble, he was able to consolidate all of his companies, keep only the most crucial parts and cull the rest. With his deft strategy and heroic confidence, Musk was able to bring Tesla into profitability, SpaceX landed a $1.6 billion contract from NASA, and SolarCity was taking off well too. He truly revolutionized four industries with his informed risk-taking tendencies and confidence even in the bleakest of times. Don’t be afraid to fail. Failure is on the route to success. Never give up even in the face of the harshest failure. Believe in your impossible dream.